Do you possess a brown thumb instead of a green one? If your soil very poor? Then this is the flower for you! One of the easiest annuals to grow from seed is Cosmos. They are prized for their prolific, silky, daisy like flowers and their easy-care nature in the garden. They will tolerate even poor soil conditions and make lovely cut flowers. They even seem to thrive on a bit of neglect. Can I Grow Cosmos in My Garden? Absolutely! Cosmos are one of the easiest plants to grow and actually like a bit of neglect. Plant Cosmos in full sun (they don’t mind afternoon shade in the hottest conditions) and give them protection from strong winds. I plant mine along a fence line with sunflowers and they are a delight to behold. Cosmos need even moisture to get started, but when they mature, they are very drought tolerant which makes them great for our North Carolina summers. As with all annuals, they will produce more and larger flowers, if they are watered regularly. The plants get quite high. Mine were about 4 feet tall last summer. They are not too bad about flopping over, so not much in the way of supports is required. Cosmos will flower from early summer until frost. Plant them after the date of your average last frost. Don’t worry if you accidentally plant them too early They are a self seeding and seem to “know” when to germinate, so the seeds won’t suffer from exposure to a late frost. Don’t fertilize. If you do, you will end up with lush foliage and not many flowers. Cut the plants in half when the seed pods outnumber flowers. This will rejuvenate the plants for the second half of the growing season. There are so many types of Cosmos available that it is a matter of personal choice. (I wrote about the Chocolate Cosmos in a previous article.) 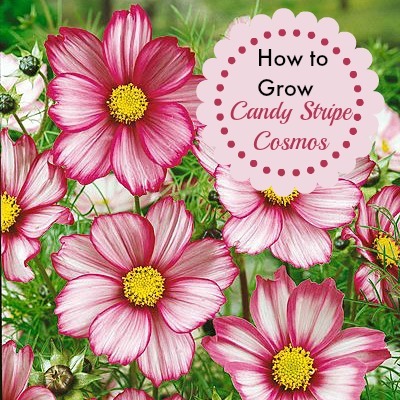 One of my Favorites is the Candy Stripe Cosmos. It is available at American Meadows. Just click the picture below for more information. Have you grown Cosmos from seed? What is your favorite variety? Please leave your comments below. How long do Cosmos take to germinate ? 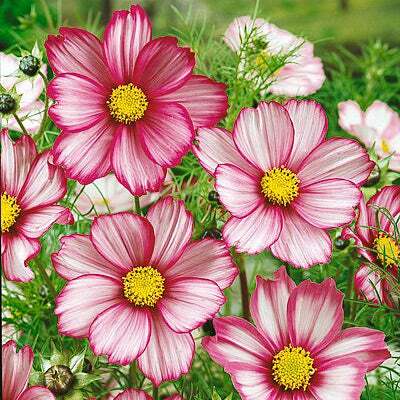 I planted some Cosmos Summer Sunshine last Wed (APril 8) , hvnt’ seen any seedlings so far. Also , are they good to be transplanted? Hi Aj. I can’t remember exactly, but when I planted mine, I am pretty sure they were up in about a week. Does it say how long to germination on your seed package? They do need moisture until they get going but are pretty heat resistant and drought resistant after that. Hi AJ. Covering does help to retain moisture but be sure to remove at first sign of life. Some seeds just don’t germinate. I would have thought they would by now. HI..when you plant outside from picked seeds from last year. Can you just sow them on top of the soil or do they have to be covered with dirt. I started dahlias, Cosmos, and Shasta daisy seeds inside. I live in zone 6, Boston area. Rooted cuttings of the dahlias, have plenty of shasta’s but only one cosmos still alive. On the last transfer to larger pots, I lost all but one. What did I do wrong? They were growing great outside. I read your article and only got one flower that I wouldn’t even call a flower. It was more of a bud that tried to flower but didn’t make it all the way. I didn’t know that Cosmos don’t like fertilizers. That is most likely the reason for only one bud. After two days of being placed and divided into larger pots, slowly all but one withered and eventually died. I lifted to check the roots, they were not great and noticed that the stems got soft. I transferred them prior and didn’t loose any, maybe one-two. What should I do with one cosmo? Plant it anyway? ?